Description: Rare annual based on the '50s TV show. 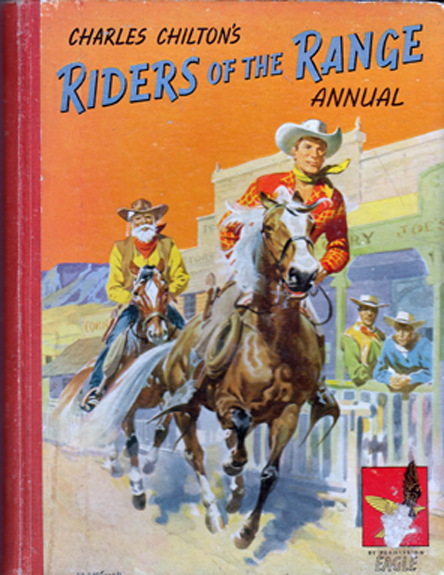 Consists of 6 stories, each of which is illustrated with 2 half-page greyscale watercolours, 3 comic strip format stories, several informative articles – including Indian smoke signals and instructions on how to make moccasins and wampums – and a number of games and puzzles Also features 4 excellent colour plates (including frontis). Three-colour illustrations on the pastedowns. The cover and spine are a little worn, with rubbing along the edges. There is some loss near the bottom right corner of the cover (visible on scan). The corners are bumped and chipped. The fep and rep have very faint discolouration, whilst the pages themselves are largely free from foxing – the bulk being present on the first and last few pages. The aforementioned puzzles are untouched, but the game has markings made in blue ink. The binding is tight. Measures 10.4″ × 7.8″ (26 cm × 19.5 cm). 4to. 96 pp.